Backward, Forward and A Giveaway! Happy New Year to you and yours! I pray that you all will have a happy, blessed 2018! For me, every new year comes with hopes for a year a little better than the last, but mostly, for good health and happiness for my family and my friends (that includes you!) and myself. It’s also a time to reflect on the happenings of the last year. The good and the bad, the sad and the happy moments, the things we might would change if we could and the things we wouldn’t change for the world. One of the things I wouldn’t change for the world is starting this blog and the companion Facebook group. I have met so many wonderful friends who share my love and obsession for Outlander! (It’s nice to know there are other Outlander crazies out there who get it. Wink, wink.) Of course, there have been some challenges as they come with every new venture but the challenges have paled in comparison to the blessings of you all allowing me a few moments of your lives to read the stuff I write – some of it being downright silly! Yet, you have stuck with me and I so appreciate that. The blog went live on August 5 with my first post and the Facebook group was created two days later. We now have 669 wonderful members in the group…and growing almost daily! I am completely overwhelmed and humbled! It has been an honor to make your acquaintance! Just as no man is an island, certainly no woman is either and none of this could have happened without the encouragement and support of some very special people. First, my husband. He got dragged into my Outlander obsession and although he doesn’t completely understand it, he does completely support what I’m trying to do. He even re-watches episodes with me and asks some pretty good questions from a strictly show watcher standpoint – he doesn’t read the books. He’s my Jamie and I so appreciate his love and support. Also, I have received a lot of encouragement and helpful advice from my good friend and group administrator, Susan Holmes Jackson. Susan has even written a couple of blog posts for me and has been by my side in the group since the beginning. What a blessing she has been! Susan also makes Outlander jewelry as well as other beautiful items (I know because I have some of her pieces). You can find her jewelry on Facebook here. Another big thank you goes to another administrator, Traci Wood Thompson, who has also contributed a blog post and has another one completed and waiting in the wings to be published very soon. More on that in just a bit. I also want to thank my other two administrators who have helped me keep things running smoothly in the group, Blair Beard and Nancy Roach (a/k/a The White Sow). You can find The White Sow on Facebook here or on Twitter @WhiteSow1. All in all, Outlander North Carolina is an ongoing team effort and I am so thankful for my team! Lastly, but certainly not least, I couldn’t have done this without all of you who are reading this post right now, those of you who have subscribed to my blog, commented on and shared my silly posts, and joined and contributed to the Facebook group! You are what makes the wheel go round and I appreciate each and every one of you. Season 4! Need I say more! If you are a book reader, you know Claire & Jamie make their way to North Carolina! Because of that, it’s going to be an exciting year for us here at Outlander North Carolina! There will be much to discuss as filming progresses, the premiere draws nearer and as the new season begins. I can’t wait to have The Frasers as neighbors! I’ve been waiting for them for a long, long time! Group Gatherings! Yay!!! We are hoping to have some gatherings throughout the state. If you don’t live in North Carolina but plan to visit, we’d love to meet you and plan a meet up around your visit. 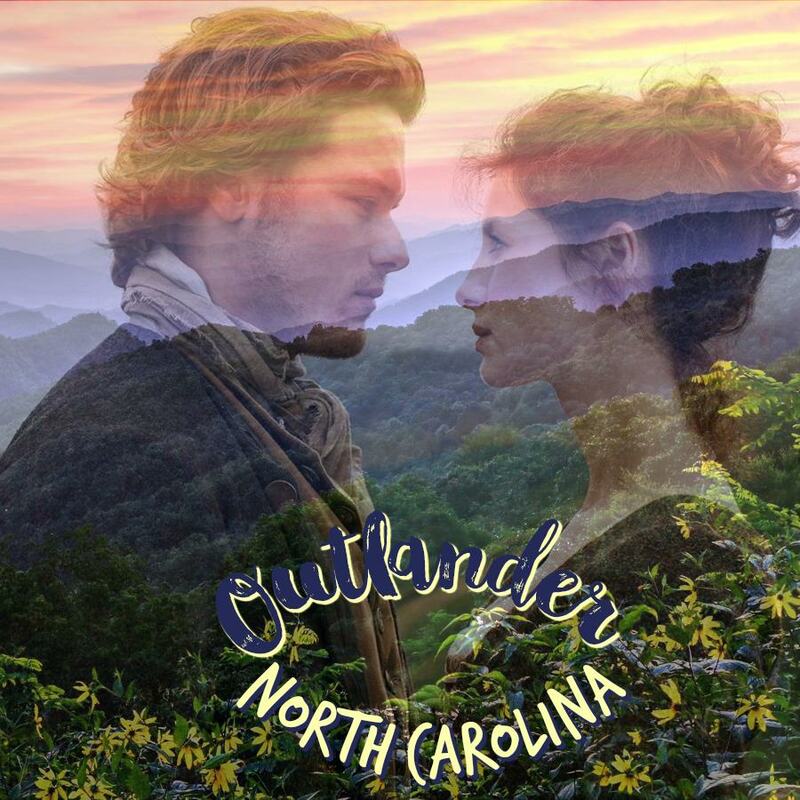 If you already live here or even if you don’t, we hope to plan gatherings in some key Outlander North Carolina locations – Wilmington, Edenton, New Bern, Hillsborough, Old Salem, Boone/Blowing Rock (a/k/a The Ridge) and perhaps, Fayetteville (a/k/a Cross Creek). A new series by Traci Thompson which will delve into the topic of Scottish Immigration to North Carolina which should be very informative for all of us history buffs and Outlander lovers. A new series by Susan Jackson on the Outlander North Carolina location of Edenton. You’ll recall Edenton from Drums of Autumn and subsequent books. This should be a very interesting look inside the colonial Edenton of Jamie & Claire’s time. More Guest Posts! You may even hear from The White Sow herself! An Outlander North Carolina Travel Guide. We’ll be working on a travel guide so you can visit all the Outlander locations plus some in North Carolina. This will be offered as a free printable to group members and those who subscribe to the blog! An Outlander North Carolina T-Shirt Design Contest. We’ve got to have an awesome T-shirt and we’re going to need your help to design it! A Listing of Outlander Events and Appearances for 2018. Conferences, charity fundraisers, and gatherings – anywhere Outlander is celebrated or appearances are made by the cast and show runners, we will try out best to list them all. A Scotland Travel Forum. I want to go to Scotland SO much and I know many others who want to also. Since some of you have already been, we’d love to tap into that knowledge bank and have a place where questions can be asked and answered plus where important Scotland travel information can be shared. More Giveaways! Yes, stay on the lookout for more of these throughout the year. We’ve had a lot of fun with them so far. In fact, keep reading below for a chance to win in our newest giveaway! Any number of things that just randomly pop into our brains! Whew! I’m tired already just thinking about all of this but very excited too! Of course, there will be a roll out so don’t expect everything all at once. Patience, Grasshoppers! These things do take time. Also, in order not to miss anything, you’ll want to make sure you are a member of the Outlander North Carolina Facebook Group (not to be confused with NC Outlander Fans which only accepts members who live or have lived in NC.) Hop on over now to make sure you’re a member of the Outlander North Carolina Facebook Group since announcements will more than likely be shared there first. Here’s the link to the group: https://www.facebook.com/groups/outlandernorthcarolina/ If you’re not a member, we’d love to have you join in the craziness! As I mentioned above, we’re having a giveaway right now to celebrate the New Year and all the good things we hope happen here at Outlander North Carolina in 2018! Facebook group member, Jennifer Pittman (no relation), who has her very own jewelry design business, has graciously contributed this gorgeous bracelet which will be given away to one lucky person. Now, to enter for a chance to win, you must leave a comment to this post. One winner will be randomly selected from everyone who comments. What should you comment about? Well, tell me what you’d like to see on Outlander North Carolina. Do you have an idea that I haven’t mentioned? Would you like to write a guest post? Would you like to contribute towards a giveaway? Would you like to help organize some events and gatherings for the group? What are you most looking forward to in 2018? How can we make Outlander North Carolina better? Want to simply say hello? See, there’s plenty to say so just say it! Je Suis Prest! Are you? Get to it then and good luck!!! And as always, thank you for reading Outlander North Carolina. NO PURCHASE NECESSARY AND A PURCHASE DOES NOT INCREASE YOUR CHANCES OF WINNING. In order to enter for a chance to win the Sassenach bracelet by Jenuine Designs by JP, you MUST comment on this post. One comment and one entry per person. More than one comment by the same person will be automatically disregarded as an entry. This giveaway begins on Monday, January 1, 2018, at 12:15 PM EST and ends at 11:59 PM EST on Thursday, January 4, 2018. The winner will be announced on the blog and on the Facebook group. You must be 18 years of age or older to enter and must be a resident of the United States. (Apologies to our international readers. Giveaway laws vary widely in different countries and giveaways are totally prohibited in some.) Selection of the winner will be made by random drawing from qualifying entries within 48 hours of the end of the giveaway. Prize will be mailed directly to the winner by Jenuine Designs by JP. Questions regarding the giveaway can be directed to outlandernorthcarolina@gmail.com.